Watch Kusi Taki on YouTube. 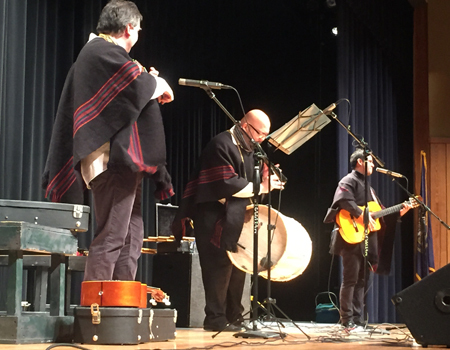 Experience the Andean cultures of Ecuador, Bolivia, Peru and Chile through an acoustic journey and storytelling. The award-winning Lincoln-based Andean musical group Kusi Taki (Quechua for ‘Enchanting Music’) will play traditional South American instruments including the Quena (flute), Zampoñas (panpipes), Charango (10-stringed small guitar) and Bombo (goatskin drum) and sing in Spanish and Quechua to bring alive the cultures and history of the indigenous people of the Andes. Director Oscar Rios Pohirieth is a professional musician and has performed throughout Mexico, the United States and Europe. With over 30 years of experience, he specializes in the music of the Andes. Pohirieth is also a traveling and teaching artist through the Nebraska Arts Council and Humanities Nebraska. Technical requirements: Generally we perform with our own sound equipment to accurately balance the different types of instruments we play, but we can adapt to a professionally run sound system. We need a floor space of approx. 21' x 16' -- the smallest area we could fit onto is 18' x 16'. Using an outside sound system, we need two vocal mikes, six instrument mikes, one Direct Input box and one drum mike. We can also perform without amplification, and be mobile, which we refer to as playing ‘Mariachi style’. Availability: Any request considered. Prefer not to travel more than seven hours within a single day.